3 EMBA CURRICULUM TIMELINE Applied Learning (modules 5, 6, 7) Masters thesis with your faculty supervisor including applied field work with your company Curriculum is subject to change. For up to date information, visit our website: MODULE 1 Oct MODULE 2 Nov 30 Dec 5 MODULE 3 Jan MODULE 4 April MODULE 5 June (abroad) MODULE 6 Sep days MODULE 7 Nov MODULE 8 March 6 18 (IFS abroad) 13 days MODULE 9 April days Building a Solid Foundation Introduction to general management Introduction to economic thinking Organizational behavior Data analysis and forecasting Accounting and performance management Mastering Management Functions Managerial analysis and decision making Operations Financial management and corporate finance Marketing management Business strategy Managing the Business Corporate strategy Managing and developing people Entrepreneurship Developing a Distinctive Edge Theory into practice: business simulation Strategic leadership: innovation and execution Innovation and new product development Organizing for innovation Business at the base of the pyramid Sustainable business Electives: International financial markets Fighting poverty with business IT for leaders Managing global brands Business ethics Anti-fraud management and compliance Transformation of the energy sector Strategic International Management International field seminar (IFS) Electives: Managing international teams Bringing technology to market Corporate governance and integrity Leadership development Individual Leadership Development Itinerary (ILDI) workshops are conducted throughout the program. PROGRAM STRENGTHS JOIN US Applied learning format Balance your executive training with professional responsibilities. One-week modules every two months let you directly apply your new skills. Business-focused course assignments and ESMT s unique project and thesis structure allow you to conduct an academic project in your organization and enhance your visibility and network across departments. Responsible leadership training ESMT s mission is to develop responsible leaders who care about the individual. Our sustainability goals are integrated into every course. You will learn to implement financial sustainability in the finance courses and explore how to increase profit while benefiting society as a whole in strategy courses. Technology and innovation track Business principles are applied directly to new, innovative case studies from a variety of technology sectors ranging from solar power to aviation to the ipad. Our leading researchers teach developing new, innovative products. You will have courses on managing people in creative organizations, bringing new technologies to market, and IT for leaders. International management track Intercultural immersion and development form part of every module. Two international modules, including a two-week field seminar allow you to experience business and societal cultures first-hand. Past destinations included Argentina - Brazil - Chile, Russia - Turkey, China - Malaysia - Vietnam. Business integrity management track EY (Ernst & Young), experts on white-collar crime, compliance, corporate governance, and business integrity will share their knowledge and experience during this track of the EMBA program. These electives will prepare you to protect your company s assets from damage caused by misconduct. 4 FACULTY AND RESEARCH APPLICATION CRITERIA AND TIMELINE STEP 1 Internal company application process for sponsored candidates ESMT receives nomination & candidate sends CV for pre-evaluation 29 FACULTY 100 % HAVE PHD S 6 TO 1 STUDENTS TO FACULTY 76 % INTERNATIONAL STEP 2 STEP 3 Prepare for GMAT, GRE or choose the ESMT Admission Test Schedule & complete admissions interview & ESMT Admission Test, if applicable Complete online application (and TOEFL, if required) Admissions Committee decision ESMT has one of the world s most diverse faculty, educated at some of the world s most prestigious business schools Harvard, Cornell, Columbia, INSEAD, LBS, Humboldt Universität and Freie Universität Berlin, to name a few. They produce cutting edge research while also demonstrating excellence in the classroom. ESMT currently has eight chaired professorships. ESMT is also home to the Center for Leadership and Development Research (CLDR). The CLDR strives to support companies in their leadership development efforts from within, while helping individual leaders with their career progression. Visit the faculty and research section of our web site for links to recent publications and more information about our faculty. TO APPLY, YOU SHOULD HAVE At least five or more years of professional experience, including three years of managerial experience with an emphasis on leadership qualities and achievements (managing people, processes, or budgets) An undergraduate degree or equivalent professional qualification Strong GMAT or ESMT Admission Test scores (The ESMT Admission Test may be taken on campus the same day as the admission interview. ); TOEFL test may be required KEY QUALITIES WE LOOK FOR IN APPLICANTS International outlook, intercultural competence, responsible approach to business Proven teamwork skills Leadership achievements and potential for high-performance career growth Excellent analytical skills Founders and benefactors of ESMT Completed online application including two references, at least one of which must be from your employer Personal interview with ESMT faculty or program director DEADLINES AND FEES Round 1: April 1, 2015 Round 2: July 1, 2015 Round 3: September 2, 2015 Applications are reviewed on a rolling basis. 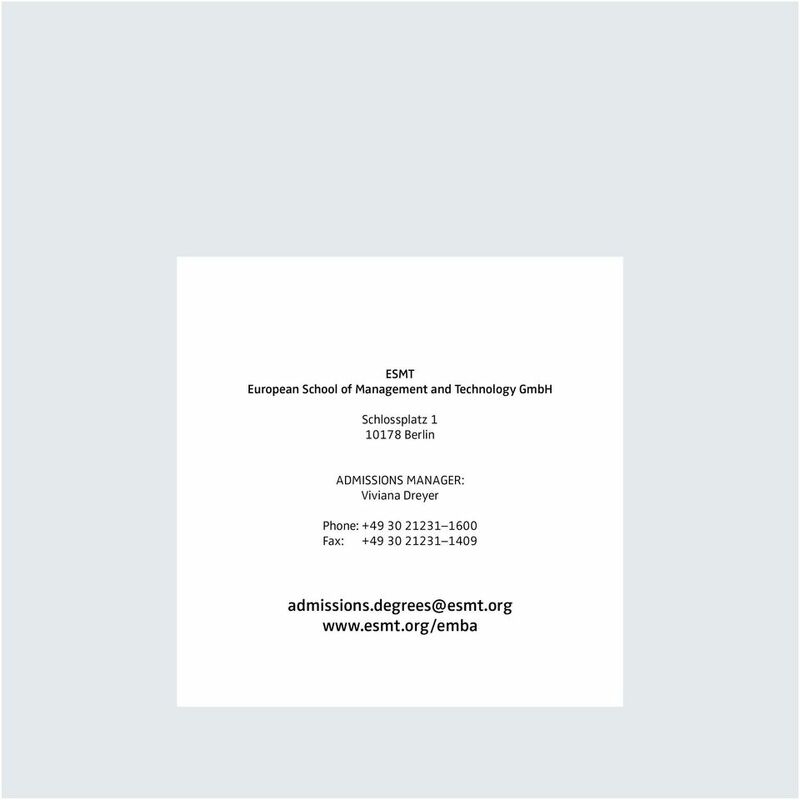 ESMT is accredited by: ESMT is a member of: The program fee is and is payable across three calender years. Some scholarship funding is available for selffinancing candidates. 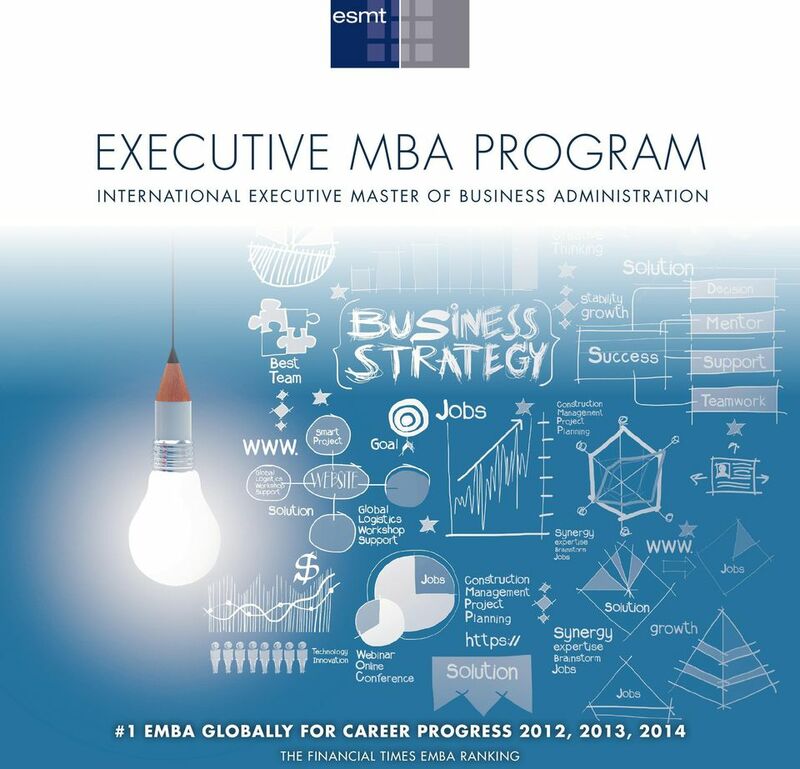 The OneMBA significantly accelerated my development as a global leader with an inspiring and challenging experience. Experience OneMBA Five schools, four continents Explore the first truly global executive MBA The OneMBA significantly accelerated my development as a global leader with an inspiring and challenging experience. IE-SMU MBA. An educational fusion. Innovatively delivered. Gain a world-class business advantage from wherever you are. MS in Financial Risk Management Real world approach to risk management theory. STAMFORD, CONNECTICUT. msfrm.uconn.edu msfrm@business.uconn. MS in Financial Risk Management Real world approach to risk management theory. HARTFORD, CONNECTICUT. msfrm.uconn.edu msfrm@business.uconn.